The rapper from Pittsburgh is a veritable weed glutton. (In a recent viral video, he bragged that he “might spend up to $10,000 on weed.”) It brightens the title of his recent mixtape, Kush & Orange Juice. (When asked if he actually has “kush” and orange juice for breakfast, he answers “I don’t always wake up and drink orange juice, but I always wake up and smoke weed.”) Even the music, an aromatic blend of cool vibes assembled by a close-knit team called ID Labs Productions, is conducive to semi-autobiographical musings about girls, street fashion, cars, money, and smoke. Wiz has decent rhyme skills and a flair for themes. But he excels at creating electric relaxation, a mood perfect for … well, you know. “I listen to certain artists for certain things. I listen to Three 6 Mafia when I’m in a rowdy mood; I listen to Snoop Dogg or Devin the Dude when I want to smoke weed; and I listen to Biggie when I want to listen to some lyricism,” Wiz says. 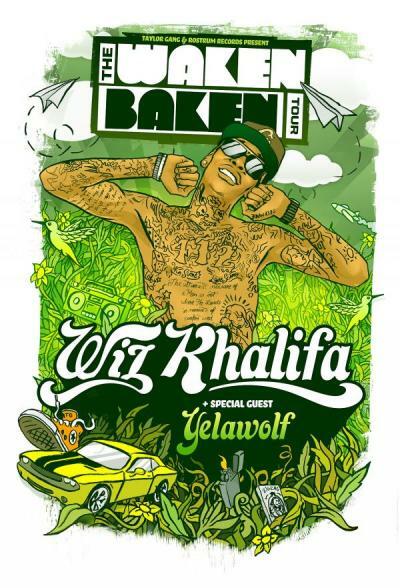 Wiz Khalifa’s “Waken Baken” tour, which lands Oct. 19 at the Fillmore, may be yet another marker in hip-hop lore — a period when the much-hyped, blog-groomed generation of MCs evolved from fresh-faced optimists unburdened by stupid intramural beefs and heinous recording contracts into nouveau riche hustlers buoyed by cultish mixtape fame and major label development deals. Wiz’s popularity is real, though — his superior 2009 album Deal or No Deal (Ihiphop Distribution) breached the top 25 of the R&B album charts, and Kush & Orange Juice was reportedly a top 10 Twitter hash topic when it hit the Internet last spring. Yelawolf’s “Pop the Trunk” is more pointed and focused than anything Wiz Khalifa has recorded. Concurrently, Wiz’s Deal or No Deal and, to a lesser extent, Kush & Orange Juice float effortlessly, while Yelawolf’s Trunk Muzik sounds workmanlike, a series of brilliant pieces speckled amid the chaff. (Yelawolf has assembled a retail version, Trunk Muzik 0-60, that combines seven of the mixtape’s best cuts with new tracks. It’s tentatively scheduled for a November release on Interscope.) The two rappers offer a nice study in perspectives. One thing Wiz Khalifa and Yelawolf have in common, though: both have a lot of tattoos. This entry was posted in Interviews and tagged blog stars, Dirty South, SFBG, weed rappin', Wiz Khalifa, Yelawolf. Bookmark the permalink.